Am I right in saying that Thanksgiving is the best holiday ever? I am rarely wrong! ....Just ask Matt. I ate so much yesterday. I made the mistake of weighing myself this morning and I was a full 5lbs heavier this morning than I was yesterday. #whoops. My mom got this awesome Delice de Bourgogne and then chopped up some dried figs, some candied pecans and then drizzled a balsamic glaze over the top of it...I ate most of it prior to the rest of the guests arriving. I have no will power when it comes to cheese....or desserts. Speaking of desserts, Mom made some awesome ones. An apple, pear, blueberry galette, a pumpkin and caramel cheesecake, and wet chocolate cake (score...wet chocolate cake 2 times in 2 weeks!). I had a generous helping of each. Wedding dress to fit in, schmedding dress to fit in. That's what I say! Typically we do not spend Thanksgiving with my family, we are normally with Matt's family. Since his parents just made the long drive from Indiana a few weeks ago for our Engagement Party, they decided not to come in for Thanksgiving. So, instead of making the drive out to Reading area, we went to my parent's house because my dad's family came in for the holiday. It was good to see all of them, and the dogs had a great time chasing the kids around. Did I mention I ate too much? Hope that you can take advantage of this great offer. Stock up for Christmas presents, dinner accompaniements, or a way to deal with your crazy Uncle Mo! They knew they were bad! Now that I have explained to you how I spent my Thursday night after arriving home from work, we can move on....to Shaina's mulled wine recipe! You may have noticed that on our website we have a new and different product called Winter Mulling Merlot. Yes! It is the same wine as our Summer Picnic Merlot. It is winter(ish) now, so I can't very well be talking about sangria and barbeques! With the holiday's coming up and with a forecasted super snowy winter, we decided we should give you guys a great recipe for mulled wine. Shaina has tested and retested this recipe to perfection. She's simmered so many cinnamon sticks that her hair smells of cinnamon constantly. Just kidding. She has tested this recipe though, and it is great. Directions per Shaina (....so if it doesn't turn out, blame her): Zest the citrus, and then slice it. Crush the Cardamom with mortar and pestle then place in the cheesecloth with the zest, cloves, and 1 cinnamon stick- tie together using the Butcher’s twine and give it a big loop. In a pan, add the sugar and water- heat on high until everything starts to simmer. Reduce heat and cook the liquid until the mixture reduces by about half...make sure that you keep stirring the mixture or it could burn! Once it is reduced, add Karamoor’s Winter Mulling Merlot and the brandy into a pot, along with the fruit slices. Put your spice bag in the pot and tie to the pot handle so you can easily remove it before serving. The longer you leave it, the stronger the spice flavor. Serve warm with a cinnamon stick in a mug!!! I don't think that it is going to get cold enough to need this recipe this weekend, but I wanted you to have it prior to Thanksgiving. BY THE WAY! Friendsgiving turned out great. The food was fab, the friends were even better. Definitely started a new tradition within our group of friends. We added gift packs to our website! Did you see?! One more week closer to my most favorite holiday....Thanksgiving! This weekend, we are having Friendsgiving which is being hosted by Matt and me! I have been making things since Wednesday. It started with a delightful butter toffee that is topped with chocolate and flaked sea salt that I decided to make as little seat settings (I bought little plastic bags with gold ties)...I'm so cute. Then last night I deboned one of the turkies I bought and put it in the old crock pot with some veggies and water to start my 36 hour stock for gravy, I also made cranberry sauce and roasted the beets that I need. Let me tell you about this cranberry sauce. Easiest sauce I ever did make. I put a bunch of cranberries in a glass dish, threw in some sea salt, orange juice, orange zest, brown sugar, and SHALLOT and threw it in the oven for about an hour at 350...stirred it a few times, but that was pretty much it. It is SO good. I was looking around the kitchen last night to find other things to eat it with. Tonight I am making wet chocolate cake with cream cheese frosting (secret family recipe), some tomato sauce, I will cube up the cornbread that I need for the stuffing I am going to make, and chop up a bunch of celery and carrots and onions. Gotta prep for success! I will let you know how things end up. That costume was SO HOT. I was dying. There is a video of me doing pullups in it, which is hilarious...but I couldn't figure out how to post that on here, so you will just have to take my word for it. So, besides talking about Friendsgiving and letting you catch a glimpse of the perfection which was my costume, I'm here to talk about gift packages that we are putting together for the holidays. 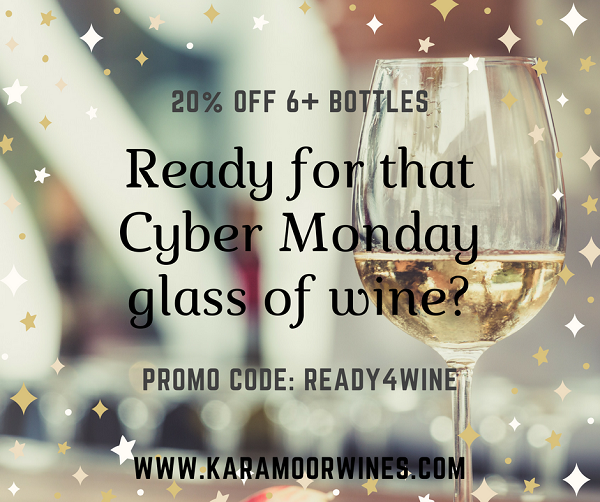 As you can see (or if you haven't seen yet, here is the link: http://www.karamoorwines.com/Store/Holiday-Gift-Packs), we have taken the guesswork out of what to choose to send your friends for (currently) Thanksgiving....or even as a little mid-week pick-me-up (our Karamoor's Choice package is perfect for that!). The 3 packs that are up on the site currently are our Turkey Pairing Gift Pack, our Ham Pairing Gift Pack, and our Karamoor's Choice Pack. We chose to include our 2013 Cabernet Franc, our 2013 Chardonnay, and our 2015 Rose in our Turkey Pairing Gift Pack. I believe that you will not be upset with pairing any of these wines with your turkey dinner this year. The 2013 Cabernet Franc will go perfectly with turkey as the red option due to the fact that it has nice fruit characteristics while still having a good earthiness. It also has nice round tannins, so it is not too dry (and since sometimes....turkey can be a little dry (depending on the cook! ), you don't want to pair a super dry or tannic wine with it). The 2013 Chardonnay is another perfect match for turkey due to the fact that it has notes of green apple and is a very fruit driven style of Chardonnay, it has crisp acidity while still maintaining an everlasting finish. It will go beautifully for the white wine drinkers of the meal. The 2015 Rose has notes of raspberries and strawberries, it is soft and balanced, it has a light and clean finish which makes it a great choice to accompany turkey, stuffing, gravy, and pretty much anything else on your table (it's not overpowering and will lift up all of the other flavors of the meal)! We chose to include our 2015 Sauvignon Blanc, 2015 Rose, and 2013 Chardonnay in our Ham Pairing Gift Pack. The 2015 Sauvignon Blanc will go perfectly with ham due to the fact that you get notes of honeysuckle, pineapple, and coconut....all flavors that are going to please the palate when paired with ham...and sometimes you even find those flavors actually flavoring the ham. What could be more perfect? WELL, perhaps our 2013 Chardonnay! It's another perfect match for ham due to the fact that it has notes of green apple and is a very fruit driven style of Chardonnay, it has crisp acidity so it evens out some of the saltiness in the ham (the same could be said for our 2015 Rose!). The "Karamoor's Choice" pack is the kind of pack for the person that likes to take chances. The pack is chosen 100% by employees at Karamoor, it may include a Reserve wine, it may include a white wine, a red wine, a rose...there is no telling! The only thing that you know is that it will equal at least $60 worth of wine! Things are back to normal around here! ONLY 3 WEEKS UNTIL THANKSGIVING!!!!!!!! Thanksgiving is my most favorite holiday. I think that the reason I love it so is due to the fact that the only thing you have to focus on during Thanksgiving is eating. Man, do I love to eat! My love of eating is the main motivator for working out (that and you know...living longer, being fit, and all that other stuff...). We are hosting Friendsgiving at our house next weekend and I have been looking for all the perfect recipes. Pretty much all of the recipes include cheese. Can't wait! I know I promised to include a photo of my halloween costume, but that will have to wait until next week because I didn't take any pictures of it and my friends who have a photo haven't sent it my way just yet. Next week...promise! "Finished picking the last of the Cab. Sauv. last Wednesday right after the hard freeze that morning and before the storm Thursday.... Got all the red grapes good and ripe, and thanks to our top-notch viticultural team, managed to let it hang as long as possible with minimal threat from disease pressures. Good concentration of flavors and color on all red varietals. Just pressed off some Cab Franc today that is looking really good already showing nice, ripe fruit intensity, and soft tannins at this early stage. Also, got good pHs and acidity on all the reds this year. The white varietals also had good acid numbers, and the quality is excellent as well. The down side to the white grape crop this year was that there wasn't enough! Much lighter that average across the board perhaps due to some winter-kill in the buds combined with a wet May during berry set. In spite of a late start to the growing season, along with our expected regional weather and challenges along the way, I'd have to say overall one of the better years that I've seen in my time here at Karamoor." It is looking like, from those 2 paragraphs, that the 2016 vintage will be something to look foward to! Great news! Another piece of great news is that we are putting together holiday gift packs this year. They are food pairing themed gift packs that are designed to go with your favorite holiday meats! Check out the packs that we have released thus far here: http://www.karamoorwines.com/Store/Holiday-Gift-Packs. I know that I promised to talk about them this week, but I wanted to show you the online article instead. We will chat about the holiday gift packs next week!